Water damage is one of the most common causes of loss in Florida homeowners insurance claims. Though most insureds expect their policy to protect them against any and every type of water damage, this is not the case. There are exclusions and limitations that you need to understand before you experience a water loss. The water damage coverage that is included with most homeowners (HO) and landlord (DP) policies. Damage must be sudden and accidental, such a a pipe burst, appliance malfunction, or water coming through a hole in your roof caused by a storm. With full water damage coverage, your policy will pay up to the total policy limit, minus your deductible. *A note on 'sudden and accidental': Maintenance issues or preventable losses are generally not covered. Examples would be damage caused by a leaky roof or pipe or by a worn-out dishwasher. It is the homeowners responsibility to maintain the home and take reasonable steps to prevent damages. This is becoming increasingly common, as water claims continue to increase. 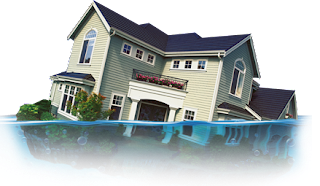 Many insurance companies exclude water damage altogether for homes over a certain age (usually 30 or 40 years), and then offer the option to purchase limited water damage coverage. This 'buyback' usually has a $10,000 limit. Flood is defined as rising water, or water that touches the ground before it comes into contact with your home. Flood is almost always excluded on HO and DP policies, and must be purchased on a separate flood insurance policy, or less commonly, as a flood endorsement that can be added to your homeowners policy. If you don't have either the endorsement or the separate flood policy, you will not be protected against rising water. This is true whether or not the floodwaters are driven by wind. Seepage is generally considered to be a maintenance issue, and will usually not be covered by an HO or DP policy. This exclusion refers to water that backs up through sewers (like from a toilet bowl), or from drains (like from a sink). The exclusion applies whether the damage is caused by a public sewer or water system, or by water inside the home. Most insurance companies offer an inexpensive Water Backup endorsement that can be added to your policy in order to remove this exclusion, and it is highly recommended. It is important to discuss your water coverage in detail with your agent. Please let us know if you have any questions. We are a local Disaster Restoration Company that provides emergency services for Residential and Commercial Properties in the Sarasota and Manatee county areas. Key Cities are Bradenton, Sarasota, Palmetto, Venice, Lakewood Ranch, and Osprey. We are Mold, Water, Odor, Cleaning Specialist. Detail Cleaning Company. more info click my blog https://sites.google.com/view/venice-fl-fire-and-smoke-damag/home.